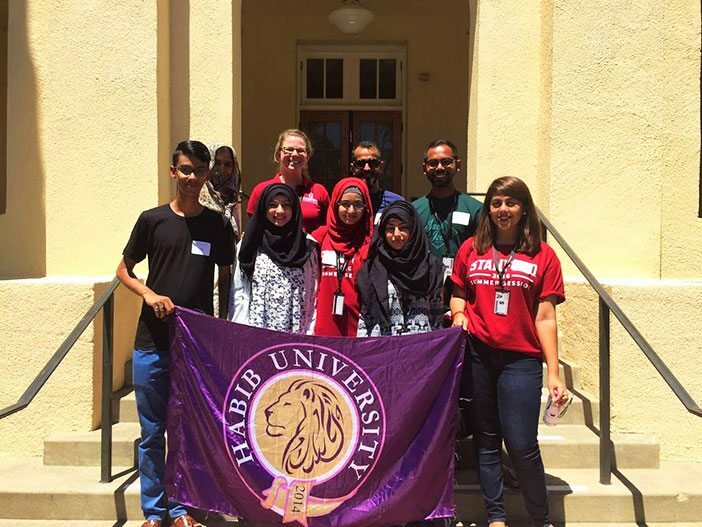 Osama Rizwan and Anas Masood, two of the Habib University students who attended the Stanford Summer International Honors Program (SSIHP), write about their personal experiences regarding both work and play. 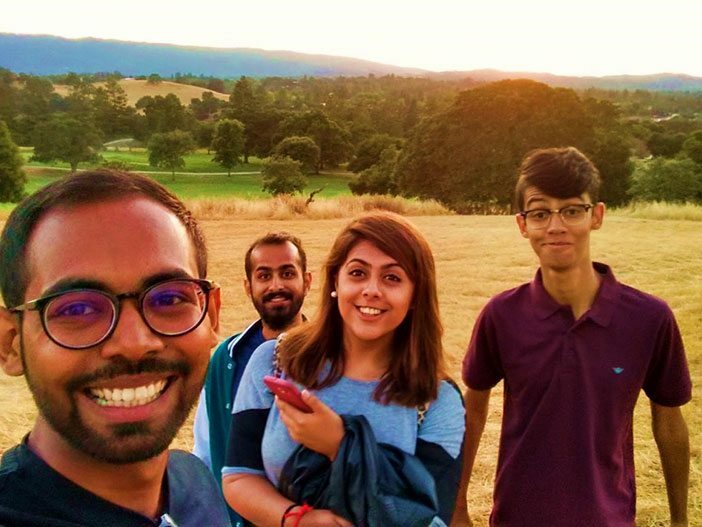 Osama Rizwan: The last five weeks of being at Stanford, learning about this academically rich and vibrant community at the Silicon Valley have been amazing. Each new day presents itself with the opportunity to soak in knowledge about one thing or the other, whether it is walking around the campus for hours or going to the Virtual Human Interaction Lab (VHIL) to interview people for a class project. During the past five weeks, I have come a long way in familiarizing myself with the campus – and falling in love with it! Our journey started off on June 18th after a hectic 16 hour long flight from Abu Dhabi to San Francisco, and even though we were jet lagged, the prospect of being at Stanford gave us an unprecedented flow of energy and excitement as we decided to start touring right away – although our primary objective was to find food…but that’s a different story. With SSIHP Coordinator, Patricia Hall, in front of Branner Hall. Branner Hall, our home for the summer, currently hosts more than 100 students from every corner of the world who have come to attend the Stanford Summer International Honors Program. We have become a closely knit community thanks to all the movie-nights, art-nights, sports, eating food together at the Arrillaga Dining Hall, and playing hide-and-seek at 2 AM (yes, we did that!). The conversations on the dinner table are so enriching in themselves that I feel extremely privileged to be in the vicinity of people who are from such diverse backgrounds. The political, cultural and social conversations born out of our gatherings give us an opportunity to look at sociopolitical matters from a completely different context – but sometimes we just like to chat about chocolates in each of our countries. (L-R) HU colleagues Sana Gondal, me and Anas Masood, walking down the Main Quad’s corridor. For the first few days we took it upon ourselves to walk around the beautiful 8000 acre campus – a seemingly impossible feat. Five weeks down and we are still exploring and finding new parts of the campus every now and then. 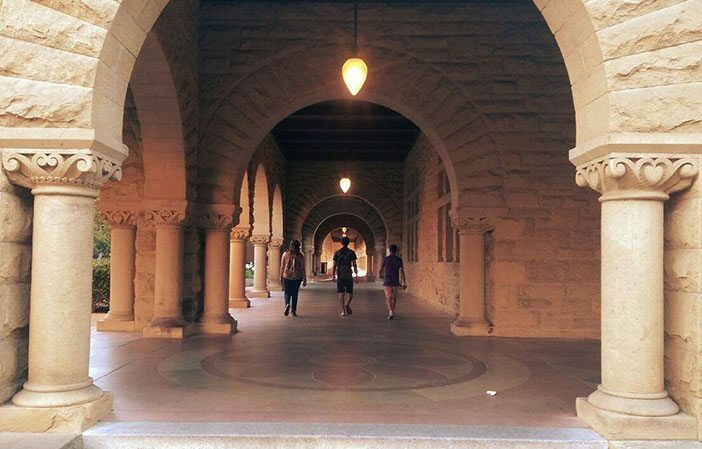 Stanford’s campus in itself is amazing; the university, 125 years old this year, is formed around beautiful old architecture involving stunning stone work. This ancient construction blends flawlessly with the more modern and technically advanced interior of these buildings. Panoramic view of the inside of the Main Quad. The Main Quad, the oldest building on Stanford’s campus – houses a lot of departments and is equipped with smart classes – quite deceiving honestly! As I make my way down to my afternoon classes through corridors, I often see hordes of tourists trying to get a glimpse of the beautiful Memorial Church inside the Main Quad, or taking guided tours of the campus. Observing them makes me even more grateful to have had the opportunity to enjoy this stunning campus daily on my regular walks. In front of one side of the Main Quad. Another important aspect that makes me feel thankful is the classes. 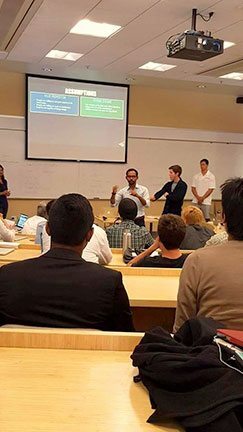 Based in the heart of Silicon Valley with numerous technology and social startups springing every year by alumni, it has become inculcated in the teaching methodologies of Stanford to produce entrepreneurs. Each class room is structured to impart the same entrepreneurial values in its students. Not only are the professors at Stanford some of the best in the world, but being in Silicon Valley gives us the opportunity to learn from some of the tech giants themselves. Presenting my business model for the ‘Technology Entrepreneurship’ class. My ‘Technology Entrepreneurship’ class is a prime example of this. The main purpose of this course is to teach students to come up with viable business models for their products and help them on their way by getting the experts on board to demonstrate. The teachers hired for this course aren’t academics, but are themselves entrepreneurs, investors and co-founders of several multi-million dollar start-ups in Silicon Valley. The class offers me a chance to learn from professionals in the field and I am all the more interested in this class because Habib University’s similar focus on entrepreneurship has helped me realize the need for start-ups in this modern, tech-oriented world. Another fascinating feature of this class has been the opportunity to work on a business idea for a startup with a team and presenting a complete business model. LEFT: Tom Kosnik, the lead instructor of the class, has experience working with Stanford’s entrepreneurial courses since 1990. He also sits on the board of several startups in Silicon Valley. RIGHT: ‘Sustainability Design Thinking’, offered by Prof. Glenn Katz, is a course based on design thinking principles of Stanford’s D.School that focuses on coming up with sustainable systems, building structures, products and ideas. Being a student of engineering, this skill and training will come in handy when I plan to start up my own venture, and the knowledge of the business world, in particular of Silicon Valley, gives me an unprecedented advantage. Moreover, I have the opportunity to interact and network with already successful business owners and venture capitalists, as this will prove extremely useful in creating my own network in future. LEFT: VP-IBM Research Jeff Welser. RIGHT: Guy Kawasaki, Marketing Specialist and Author. I was also fortunate enough to attend lectures by tech giants such as the Vice President of IBM-Research, Jeff Welser, Chief Evangelist at Canva, Guy Kawasaki, the chief technology officer of AT&T, and the chief internet officer of California. 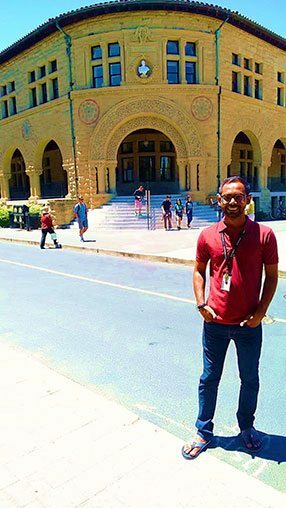 Hearing all their stories and getting their insights about running a thriving business is extremely crucial and this experience would not have been possible had it been any other place than Stanford University. Catching the sunset atop the hill at Stanford’s Student Observatory. Coming here, one thing that I was quite excited about was to experience living in a dorm, and so far it has been wonderful. From exploring random academic buildings and interacting with professors, to running up to the Stanford Student Observatory, to catching a glimpse of the sunset atop the hill, Stanford has a lot of recreation to offer. 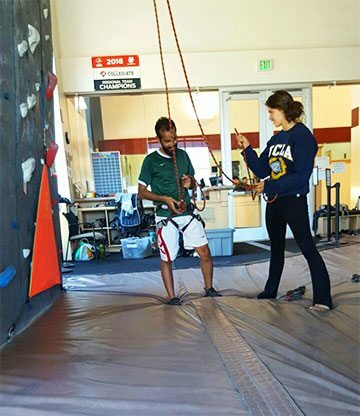 The on-campus gym also boasts a variety of recreational activities so if you are ever bored you can indulge in some wall climbing at the free wall-climbing facility (you can even attend a small course on tying the climber’s knot and belay, and be certified…how amazing is that?! ), or swim in one of the five Olympic sized swimming pools. LEFT: HU colleague Hasan Naqvi and I outside Stanford’s Automotive Innovation Facility. MIDDLE: Stanford’s Autonomous Self-driving Car. RIGHT: Stanford’s Solar Car. With all the research studies going on at the campus all year round, it is entirely possible that you run into a lab where a group of engineers, computer scientists, chemists, biologists and ‘economists’ are working together to build solar and self-driving cars – talk about transdisciplinary education. The whole philosophy of Habib’s liberal core and transdisciplinary education seems to come together pretty well here, and it restores my faith in HU’ vision even more. Over the last five weeks, we have also tried our best to utilize our weekends. Usually, our house RAs (Residence Advisors) organize trips to all the outstanding places nearby, which most of us have been part of. 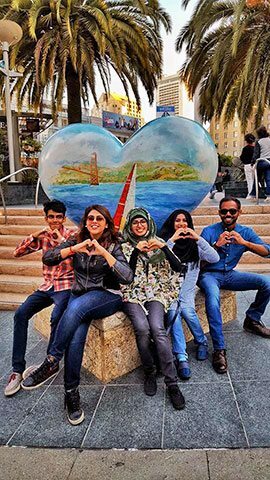 Our trip to San Francisco has been my favorite excursion so far. It is alive with such a buzzing touristy energy. With roadside graffiti artists, rappers and musicians all around, San Francisco Bay is definitely refreshing and invigorating. Our presence here has gotten people excited about Habib University and its vision, with many of my professors expressing keen interest in visiting HU. 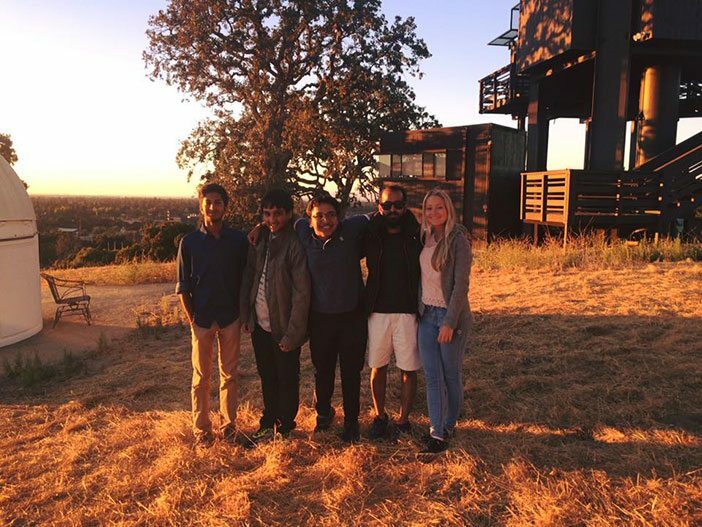 Anas Masood: The past week has been very hectic for all of us here at Stanford, as we are trying to make our way through mid-terms. At the same time it also feels like home and in fact we have become very well-attached to the friends we have made here. I spent the entire week preparing for my midterms with my new found friends, and to take a break, we conducted a spectroscopy of the sun! 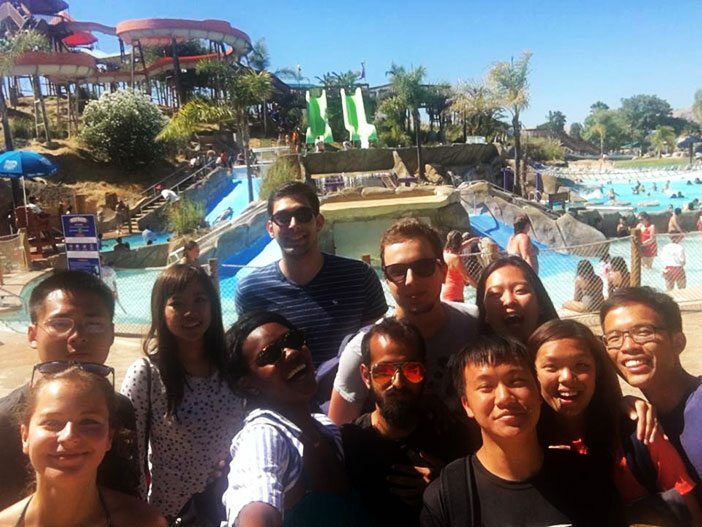 Over the weekend, I had the opportunity to enjoy some time at the Raging Waters Water Park in San Jose and also befriended a lovely person named Norah. She is from the Ivory Coast and studies in France. Similar to what my HU colleague Moizza Salahuddin mentioned in her travel log, I have experienced many ‘firsts’ too here at Stanford. The past week I made use of the office hours of my instructors and went to see my professor for neuroscience and we had the most thought-provoking conversation about the future of neuroscience. Josiah is a grad-student in the Psychology department and therefore brought a new and different kind of insight into my research project. It was also the first time that I ate a proper American dinner with a medium rare steak. This was with a friend’s father who had come to visit, who had invited me to have dinner with them. Another first was my trip to the American Heritage Museum, where an exhibition of Vintage Pinball Machines was taking place. And finally for the first time in my life, I experienced rock climbing and enjoyed it thoroughly, so much so that I plan on going back again very soon with my friend Jason.